How can we create more opportunity and jobs in rural Washington? PORT ANGELES—A packed room of stakeholder and business leaders met with lawmakers from around the state to talk about boosting jobs and development in rural Washington. 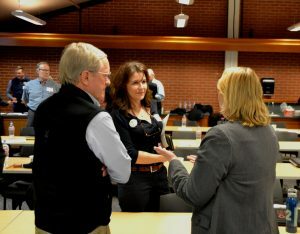 Chapman was joined by his seatmates, Rep. Steve Tharinger (D-Port Townsend) and Sen. Kevin Van De Wege (D-Sequim) at the event, held at Peninsula College. Speaker of the House Frank Chopp (D-Seattle), who grew up in Bremerton, pointed out Rep. Jake Fey (D-Tacoma) was born in Port Angeles and that Rep. Tana Senn (D-Mercer Island) made the trip despite being in Spokane the day before for an early learning conference. Traveling the state to listen, learn and work with others, Chopp said, is what One Washington was all about. 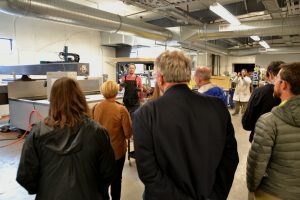 “It was exciting to hear about new ideas and innovations happening right here in the 24th District,” said Rep. Tharinger, chair of the House Capital Budget Committee. 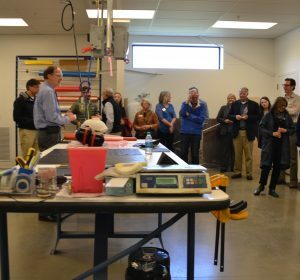 Tharinger joined lawmakers, local officials and stakeholders on an afternoon tour of the Composite Recycling Technology Center (CRTC), a non-profit founded in 2015 to find uses for the leftover composite material that Boeing and other manufacturers don’t or can’t use. Wood pointed out the example of the Brock Commons building in British Columbia, built with mass timber in just 10 weeks. It would have taken one year to build using steel and concrete, he said. In the morning session, State Commissioner of Public Lands Hilary Franz said she grew up in rural Washington on a ranch and appreciated a passionate speech by Rep. Chapman at a different event earlier. Franz recounted that Chapman talked about how rural Washington is the best possible place to live, with clean air and water, beautiful trees and mountains—and no traffic, something she appreciates more and more having to travel up and down I-5 for work. It takes land, local involvement and lawmakers to make progress on rural development and jobs, she said, and the state has the first part—land—with six million acres under its stewardship. Franz thanked lawmakers and Speaker Chopp for their leadership on wildfire prevention and for funding to help her department clean up derelict vessels, with Grays Harbor County alone spending $1.6 million to handle the problem. New approaches should help reduce those costs, she said. A mill in Raymond is also reopening thanks to local partnerships, help from DNR and funding from the legislature, Franz said. Mass timber is also a part of preventing wildfires, as it makes thinning profitable since mass timber can make use of smaller trees. Darryl Wolfe from Olympic Medical Center said housing is a big issue, since it’s hard to attract and hire new staff when the price of housing is high or there’s no housing available. Tourism is a growing part of the local economy, said Nathan West from the City of Port Angeles, with six record years of tourism in a row. West said rural cities and counties don’t have the revenue streams of urban areas and therefore rely on state services like the Community Development Block Grant and low-interest loans through programs like the Public Works Trust Fund. Economic development is different in different counties around the state, said Barry Berezowsky of the City of Sequim. He said jobs and opportunity come from focusing on local community strengths and growing businesses from within rather than hoping to lure big outside businesses to move in. One-size-fits-all rural development doesn’t work, Berezowsky said, so rural communities have to be involved in the decision making that affects them. Jim Stoffer of the Sequim School Board said school construction was a major issue, with the state school construction formulas unchanged since 1972. He thanked lawmakers for the mass timber classrooms built at Grey Wolf Elementary as a pilot project and said there was voter confusion about bonds and levies, confusion that would be helpful to clear up. “Levies are for learning and bonds are for building,” Stoffer said. Port Commissioner Steven Burke said air service was a big need, with rural areas such as Port Angeles ideal for jobs that aren’t location dependent except for the lack of air travel options. The economics simply don’t pencil out right now for air carriers, he said, with few carriers using planes of less than 88 seats. Rep. Vandana Slatter (D-Bellevue) asked about the possibility of using smaller, electric-powered aircraft with lower costs and fewer seats to fill that niche for rural airports. “We’ll take it if it’s electric, coal, solar, whatever,” Burke said. Lisa Perry from Sierra Pacific pointed out the shortage in skilled workers, with good jobs at her company paying $60,000 to $80,000 a year without a college degree. “It’s a false choice to say to kids, there’s four-year schools and then there’s failure,” said Perry, who advocated for a better regional match between skills needed by workers and employers and what’s offered at local colleges. “This state is a tree-growing machine,” Perry said, adding that today’s timber jobs are actually high-tech, with lasers and robotics in the mills along with innovations like mass timber. 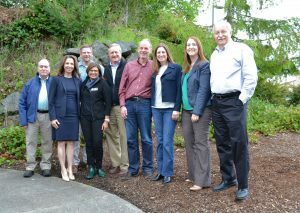 Lawmakers, local officials and stakeholders met in Port Angeles on May 10 to focus on rural economic development. From left to right: Rep. Mike Sells, Commissioner of Public Lands Hilary Franz, Rep. Mike Chapman, Rep. Vandana Slatter, Rep. Steve Tharinger, Rep. Jake Fey, Rep. Tana Senn, Rep. Noel Frame and Speaker of the House Frank Chopp. Photo by Guy Bergstrom, courtesy of the House of Representatives. Karen Goschen from the Port of Port Angeles gives a presentation about challenges and opportunities in rural Washington from the point of view of ports. Photo by Guy Bergstrom, courtesy of the House of Representatives. Rep. Steve Tharinger listens to stakeholders during the rural economic development summit in Port Angeles. Photo by Guy Bergstrom, courtesy of the House of Representatives. 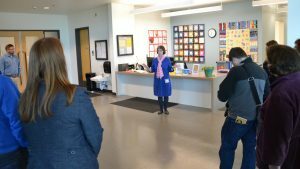 Lawmakers, local leaders and stakeholders tour Peninsula College’s early education center. Affordable child care also came up at an issue in the first rural economic summit in Aberdeen. Photo by Guy Bergstrom, courtesy of the House of Representatives. 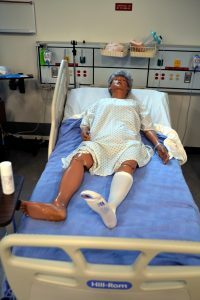 An interactive training patient at Peninsula College’s nursing school. 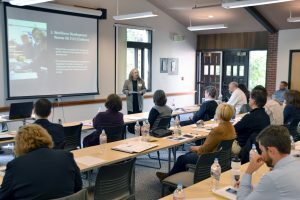 Health care was a major topic at the rural summit in Port Angeles. Photo by Guy Bergstrom courtesy of the House of Representatives. 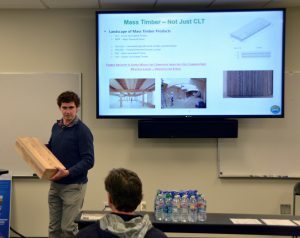 Geoffrey Wood, Vice President of Innovation at the Composite Recycling Technology Center, holds up an example of mass timber and explains the different forms it takes. Photo by Guy Bergstrom, courtesy of the House of Representatives. Dave Walter, CEO of the Composite Recycling Technology Center, leads lawmakers and stakeholders on a tour of the facility. Safety glasses required. Photo by Guy Bergstrom, courtesy of the House of Representatives. 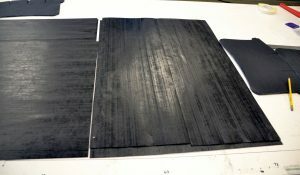 Examples of flat, uncured composite material before it’s cut, molded into shape and hardened through heat and pressure. Photo by Guy Bergstrom, courtesy of the House of Representatives. A demonstration of the water-cutting machine at the Composite Recycling Technology Center in Port Angeles. High-pressure water is one of the few ways to cleanly cut cured composite material. Photo by Guy Bergstrom, courtesy of the House of Representatives. Washington State House Democrats > Mike Chapman > How can we create more opportunity and jobs in rural Washington?